With Pixel, we obsessed over every detail, from the industrial design to the user experience. We carefully sculpted the surfaces of the phone, and rounded the edges to make it easy to grip. We used 2.5D Corning® Gorilla® Glass 4 on the front display and back glass to accent the aerospace grade aluminum body. The glass on the back also features Pixel Imprint, our fingerprint sensor, which is placed on the back of the phone where your finger expects it. You can even swipe it to access your notifications. And no matter what you’re using your phone for, you’ll need a battery that lasts all day and charges fast — up to seven hours in 15 minutes. The best smartphone camera. Ever. The Pixel camera is not only the best smartphone camera we’ve ever made, it’s the highest rated smartphone camera anyone has ever made. Our DxOMark Mobile score of 89 is a great example of what’s possible when great hardware meets great software. Pixel puts cutting-edge computational photography in an ultra-fast and easy-to-use camera. Pixel has a 12.3MP camera, featuring an f/2.0 aperture and big 1.55 micron pixels to capture lots and lots of light. Our team of photography gurus and image processing experts have spent the last year designing and tirelessly optimizing our entire camera stack. Pixel’s camera lets you take stunning photos in low light, bright light or any light. Catch action shots as they happen with Smartburst , which takes a rapid-fire sequence of shots and automatically selects the best one. Use Lens Blur to achieve shallow depth of field and bokeh effects, making your subject pop. You can capture dramatic landscapes or make faces glow with new exposure controls. And as a special bonus for Pixel owners, we’re including free unlimited storage for original quality photos and videos at full resolution in Google Photos. Pixel ships with the newest Android operating system, Android 7.1 Nougat. Phones will get software and security updates as soon as they’re available, directly from Google. We’ve also made the update process easier. When a new update is available, it can download and install in the background — no more waiting around for your phone to update. Pixel comes in two sizes, 5” or 5.5”, and three colors: Very Silver, Quite Black and our limited edition for the U.S. only, Really Blue. And whatever you choose, we’ve got cases to match. In addition to customizing Live Cases with your favorite photos and places, we’re introducing a new Artworks collection that features exclusive designs from artists like Justin Maller, and photographers like Canadian astronaut Chris Hadfield. We’re also excited to offer a new collection of silicone and clear cases. 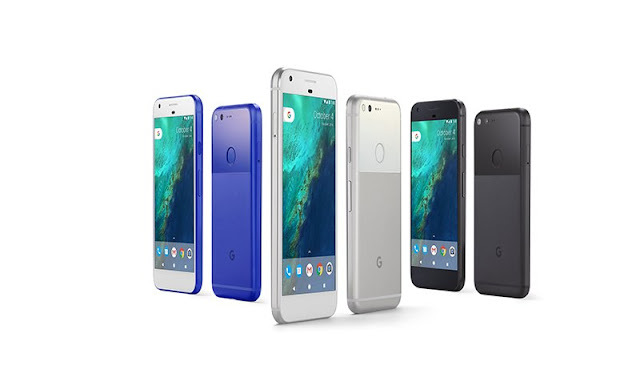 Pixel is available for pre-order today starting at $649 in the U.S., U.K., Canada, Germany and Australia. Pre-orders in India will begin October 13. In the U.S., we’re teaming up exclusively with Verizon to make Pixel available nationwide at all Verizon retail outlets, including Best Buy stores. We’re also offering Pixel unlocked on the Google Store and, for you Project Fi fans out there, you'll be happy to know that Pixel is the latest device to work on the Fi network. Personally, I’m rocking the 5.5” Quite Black with a Live Case centered on 1060 W Addison. Go Cubs!